ein hod: Kin-Dza-Dza! A Russian Steampunk Epic Кин-дза-дза! Kin-Dza-Dza! A Russian Steampunk Epic Кин-дза-дза! 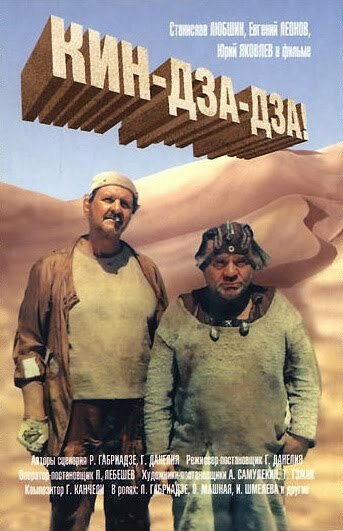 At first glance, Kin-Dza-Dza!, a science fiction epic about two Soviet men transported to a desert world, seems anything but subtle. Stranded in a world where everyone can read minds but the local language has only a few words (a dozen or so technical terms plus "kew" - a curse word and "koo" - every other word), where a single sulfur match is worth a fortune, and where wearing yellow pants is a sign of great status, the two must survive by learning to hang a bell in their noses and to squat the appropriate number of times when a superior walks by. This is a scenario that would have been easy to mishandle, to say the least. The script by Georgi Daneliya and Revaz Gabriadze is masterful, however. At times biting, at times gentle, it pushes the surface plot forward relentlessly while each scene, each conversation, each exchange rings with hidden truths. Reserved direction and dry-yet-deep performances by such superstars of Russian cinema as Stanislav Lyubshin, Yuri Yakovlev and Yevgeni Leonov combine to result in a film of unexpected poignancy. This film, with all its outlandish props and crude special effects, is chock-full of insights into society and human nature. It's also one of the funniest films I have ever seen, even if the laughter sometimes hurts. Слово «ку» совпадает с португальским непристойным словом «cu», которое можно перевести как «задница». Интересно, что комедия «Кин-дза-дза!», где это слово употребляется весьма часто, участвовала в показах на кинофестивалях как раз в португалоязычных странах (Бразилии и Португалии), где, несмотря ни на что, (а может — именно по этой причине) получила призы.